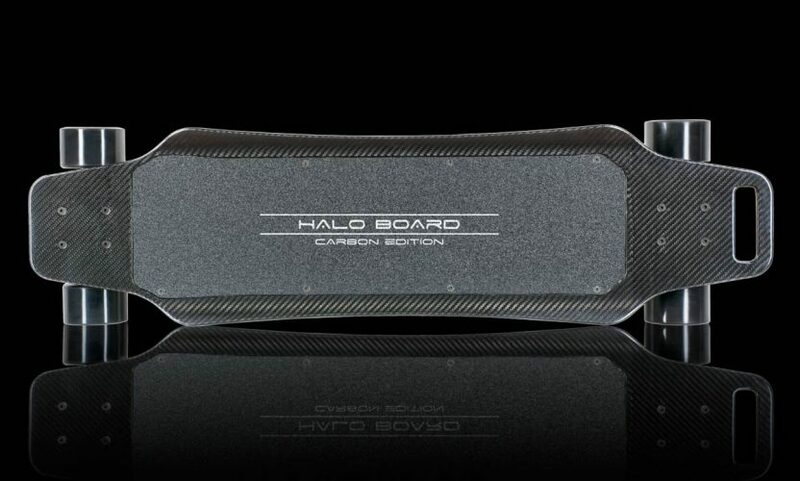 The all new Halo Board Carbon Fiber Electric Skateboard – Better than a Hoverboard? Although I tried my best to participate in the hoverboard craze (or should I say, Self-balancing scooter craze? 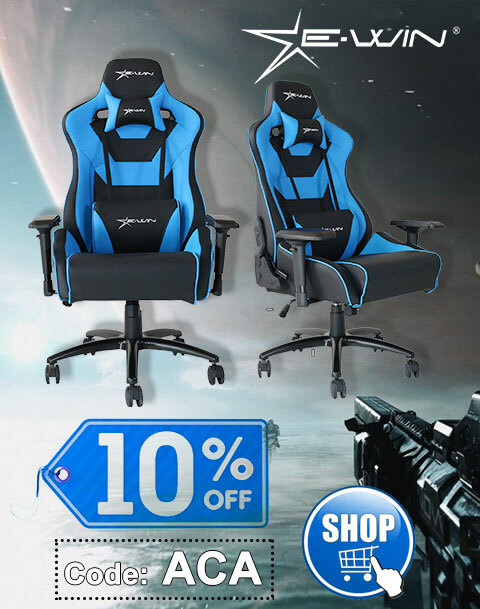 ), I just couldn’t get the hang of it. The Halo Board on the other hand offers a more familiar skateboard form factor, which I suspect will make it a lot easier for me and others like me who were “thrown” by the surprisingly unnatural feel of the other design. The underside of the Halo Board. 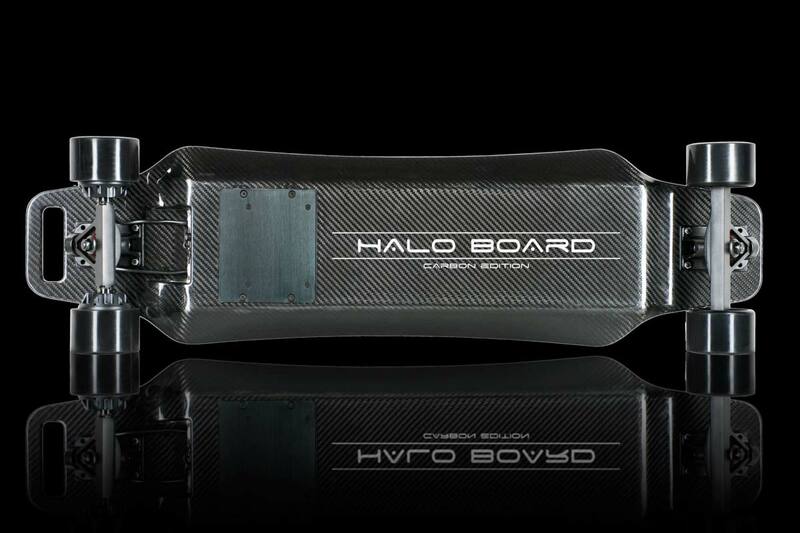 The all-new design of the carbon fiber Halo Board electric skateboard translates to a weight of just 14.75 lbs and a generous carrying capacity of up to 286 lbs. On a three hour charge of its 3000 watt dual motor design, you’ll get up to a 12 mile range, although naturally that will be lower if you regularly top out at its max speed of about 22 MPH. Taking another lesson from the hoverboard craze and the insane issues with exploding batteries, the Halo Board features a 7AH certified firesafe LG lithium ion battery to go along with a UL certified charger. 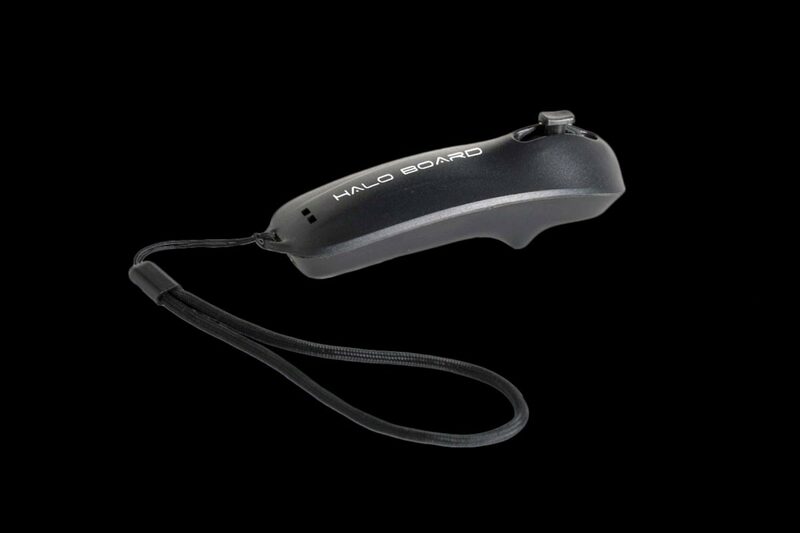 Perhaps an even bigger contrast is that the Halo Board comes with an ergonomic Bluetooth remote control for instant acceleration, braking, and reversing. The wireless Bluetooth remote control. Interestingly, even on hills, the Halo Board can still perform. It can power up and over a 25 degree hill grade and its regenerative eABS system slows you as you ride down. 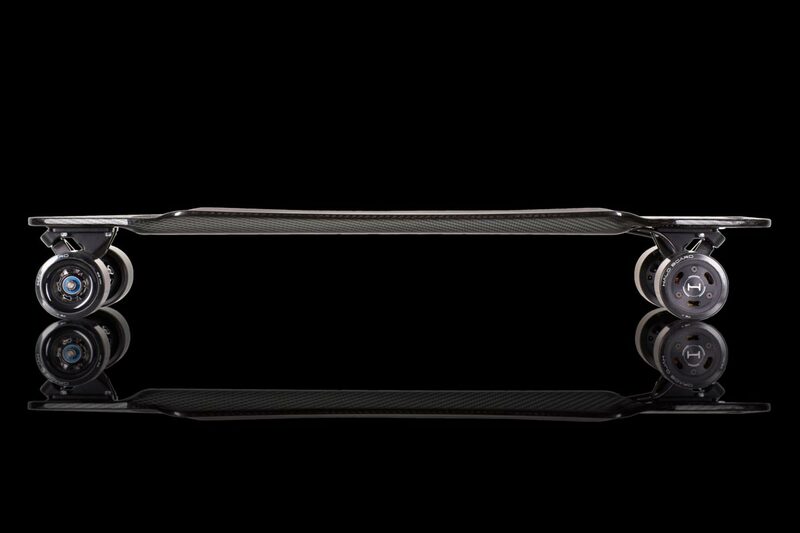 With its custom-made aluminum trucks and 83MM wheels with 78A softness, it should do well absorbing the impact and rumble you’d normally get on rougher roads. 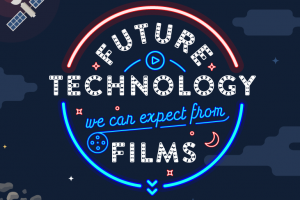 There’s a lot of tech in there, but it’s still surprisingly thin! As you can see from the photos, the Halo Board looks pretty cool as well. I’m especially impressed by how thin the board is considering all the power that it packs inside. Even its dimensions of 36 x 9.8 inches belie the tech its packing. I’ll definitely continue to keep an eye on the Halo Board after it starts shipping in July.